As both a teacher and parent I am a HUGE fan of books by Julia Donaldson/Axel Scheffler, so when we were invited to watch The Gruffalo Live﻿ the weekend before Christmas I of course said yes! The Gruffalo is undoubtedly one of my favourite children's stories, I love reading it to a whole class of children or at home to Mr Eliot, in both cases it is always a hit. This was actually the third time I've seen the live performance (teacher perks :P), the first time I watched it was in 2010 with two classes of year 1 children, the second in 2014 with two classes of year 2 children and the most recent with the OH and Mr Eliot. The production is by the Tall Stories theatre company, in theatres since 2001 it has has evolved over the years and was back at the Vaudville theatre with a new set and new costumes. I was so excited to be watching it with my own son but also a little apprehensive about Eliot being able to watch the whole show. The show is recommended for 3+ on the website but I definitely think it depends on what type of toddler you have and whether or not they can cope with sitting through the show. Eliot is a two and half year old who likes to be on the go pretty much all of the time (you can see why I was apprehensive) but I thought he did really well on his first trip to the theatre. The show is 55 minutes long, just about right for those with younger children, it didn't have an interval which was perfect. When I watched it in 2014 there was an interval, perhaps because it was a showing for school children but I personally preferred it without the interval. If you know the story, you may be thinking 'how can The Gruffalo last for 55 minutes?' but the magic of theatre adds in lots of extra bits including songs, some which get the audience joining in and singing along. I still have one of the songs in my head which I belt out even though I only remember the first line, continuing by humming/whistling! The characters were brought to life on stage by three amazing actors, one taking on the role of fox, owl and snake. All performed outstandingly and portrayed the characters from the story accurately. I love how you get to know a bit more about each character through how they are adapted for the stage. My personal favourite is the owl, I can just imagine an actual owl being like the stage character. 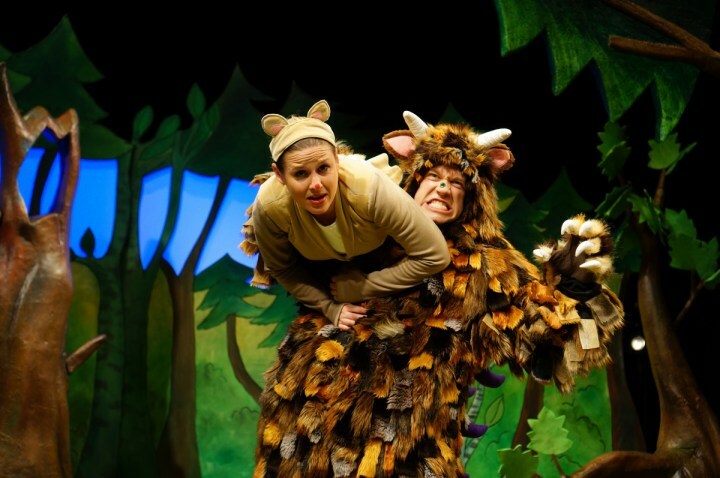 This is a perfect family show, whether or not you are Julia Donaldson fan the live production of The Gruffalo is highly entertaining and I recommend putting it on your 'to do list'. Tall Stories also have productions of The Gruffalos Child and Room On The Broom which are definitely on my to do list, I'm itching to see the live performances! 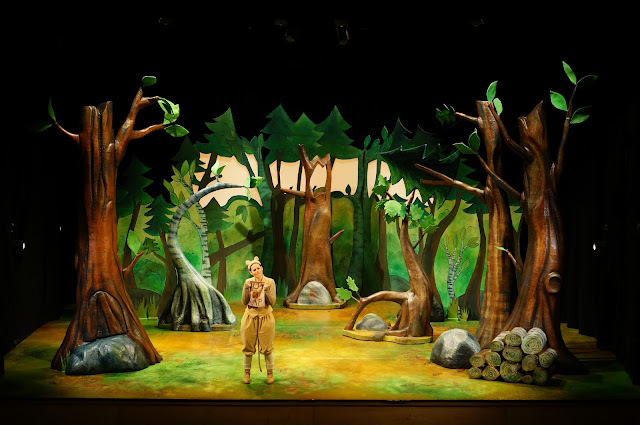 The Gruffalo is at the Vaudville theatre until tomorrow but do check Tall Stories for future perfomances!